RBR Snow Contractors was established in 1974. We started out by purchasing one truck with a snow plow and working out of an office in the basement of a home. Thanks to a combination of word of mouth and the high quality of the work, business grew steadily over the next few years. During the first quarter of 1978 – The Year of the Heavy Snows – Long Island was hit by two unusually heavy storms. Accumulations totaling 19.9” in January followed by a February storm that dumped 29.4” gave RBR the opportunity to prove itself. The company’s exceptional performance during these crises helped the business grow from a “Mom and Pop” company to a major privately-owned commercial snow removal business. As business continued to grow for RBR so did the responsibilities. The next year, RBR incorporated and became RBR Snow Contractors Inc. with two additional professionals joining the firm and continuing to grow at the rate of about 20% a year. By the 1980s the company had grown to three partners, six full time employees and 80-90 subcontractors and a company-owned fleet of over 20 plows and sanders. 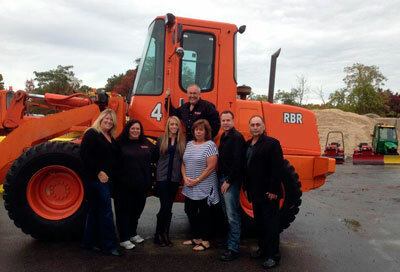 RBR was fast becoming the largest snow removal company in the northeast. In 1985 RBR Snow Contractors Inc. purchased one of its major competitors and the following year the name was changed to Melville Snow Contractors, Inc. Together RBR and Melville became the largest private snow removal firm in the northeast with a fleet of over 200 trucks, plows and sanders as well as wheel loaders for the tough winters. In 2014 RBR/Melville owner/ partner Robert Wesolowski opted for retirement life and left his seasoned staff and brother to join Gordon Lenz II and his management team to expand and improve the company to what it has grown to today. The teams’ first-hand knowledge of the snow management process, flexible contract choices, diligent GPS enhanced tracking and dispatching, field supervisors, and 24-hour service during all winter events continually assures all work meets the highest standards in the industry. Today, Confer RBR is well-respected by their clients and industry peers. We continue improve our services through technology; service innovations and state-of-the art equipment which assures our clients receive the best service with competitive pricing. When it comes to snow; we know!! So, when it snows, go with the pros; Confer RBR is based in Long Island and serves New York City, Queens, Nassau and Suffolk Counties.